Enjoy the bounty of this golden squash by cutting it into cubes and roasting in the oven with olive oil and a few more tasty ingredients. It's so good (and good for you), your family will want to have it again and again! With a sharp knife, place the squash on a cutting board and cut off the top and bottom. Cut the squash in half where the rounded bottom meets the longer top (across the middle, not lengthwise as we do for baking two halves). Each section of the squash should now sit flat on the cutting board, making it easier to work with. With a vegetable peeler or small knife, remove every bit of outer rind from both pieces of the squash. Cut the rounded end of squash in half and scoop out seeds (reserve for roasting if desired, just like pumpkin seeds). 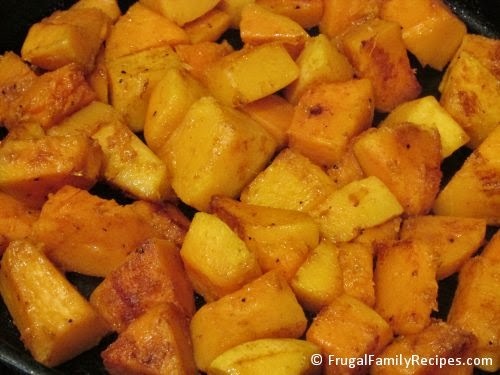 Then cut squash into 1-inch cubes and place on foil lined baking pan. Drizzle with olive oil, sprinkle with salt, pepper, cinnamon, and cayenne (if desired), then toss gently to coat well. Roast squash for about 30 minutes at 375 degrees, or until the largest cube is fork tender. If desired, transfer squash to iron skillet for the last few minutes to caramelize (as shown in my photo above), turning squash pieces gently with a spatula. Serve warm. To share a recipe with our readers please send your email to editor@betterbudgeting.com.